In spite of its dark craters, the moon radiated against a bright blue sky. A dry Pakistani village was being lulled to sleep with Reshma‘s long-gone voice, probably heard on the radio. The famous song of the late Pakistani folk singer found a listener in Sunny Arora, an Indian filmmaker in the captivity of militants. Indeed, it was a night of birha (separation) for the Mumbai boy, the lead actor of ‘Filmistaan‘, after he was mistakenly abducted by militants on the Rajasthan border in the film. The simultaneous rendition of the two songs created the semblance of a single composition. And that’s exactly how Reshma once performed in a live concert while graciously acknowledging the Punjabi song’s influence on Mangeshkar’s singing in ‘Lekin‘, a film directed by Gulzar. ‘Yaara silli silli’ is among the most celebrated in Mangeshkar’s massive repertoire and fetched the Indian nightingale, who also produced the film, the National Award for best playback singer. Gulzar bagged the best lyricist award and Hridaynath Mangeshkar, the singer’s brother and co-producer, received the National Award for best music direction. The Reshma song was written by Manzoor Hussain Jhalla, Pakistan’s well-known songwriter of mid-20th century. Besides Reshma, Noor Jehan and Runa Laila also sang his kalam (composition). 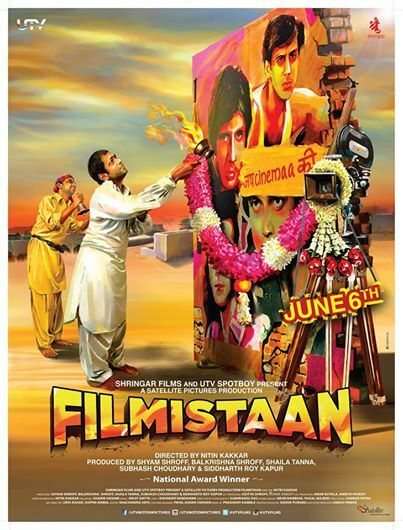 In ‘Filmistaan’, the Indian hostage finds a temporary home in a Pakistani hamlet through their shared love for Bollywood films – a far more convincing scenario than the clueless, forever-disgruntled and bigoted kidnappers. A Pakistani film pirate, Aftab, strikes an instant chord with Arora – locked up in the former’s house – because of their passion for Hindi cinema. Their equation is a perfect throwback to Bollywood’s famous on-screen chum pairs to the extent that Aftab hatches a plan to drop his Indian brother back to the border. One night, villagers huddle together in the open to watch Sooraj Barjatya’s ‘Maine Pyaar Kiya‘ (1989). When the audio of the pirated DVD abruptly drops, Arora promplty provides dialogues for Prem (Salman Khan), who is having a dramatic audience with girlfriend Suman’s (Bhagyashree) father. That India makes far more films than Pakistan is universally known and that Pakistanis enjoy Hindi cinema more than their own is no secret either. The thriving piracy business – that Aftab is a part of – is largely fed by intermittent but prolonged bans on screening of Indian films in Pakistan. In 2006, former Pakistani ruler Pervez Musharraf eased rules on the import of Indian films into the Islamic country. “Indian movies have largely fuelled a boom at the Pakistani box office after … Musharraf eased restrictions on their import in 2006. The screening of Indian movies was banned by Pakistan after the 1965 war but pirated copies of the films were widely available across the country,” according to a PTI report on NDTV. Last December, a petition seeking a ban on Indian films filed before the Lahore high court was withdrawn, DNA’s S Balakrishnan reported. But what stops India from screening Pakistani films? Indians love their ghazals, qawallis and folk music. Their artists do exceedingly well in India. In Punjabi and Urdu, we share a common language, at least in parts of north India. May be, may be not. When we can borrow their interests in music, why not films? But Mr Patel, what about the business rationale of such a move, considering Pakistani films are far behind their Indian counterparts in quality?